If you are already an experienced skier and snow sports addict, or even if you have only ever visited those dry or artificial ski slopes, consider spending part of your gap year training to become a ski or snowboard instructor. Winter sports holidays are immensely popular and good ski or snowboard instructors are always in demand every season. There are plenty of reputable organisations offering ski and snowboard courses in some of the world's most beautiful ski resorts, and most will then help you find a job to pay for the rest of your year! Grab your chance to put those family holidays learning to ski to good use. Take a look at the specialist companies we feature below and find the option suited to you. 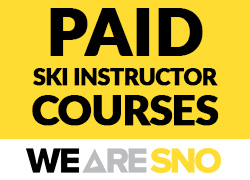 Qualify to work in a ski resort - All-inclusive ski instructor courses and snowboard instructor courses from 3 – 19 Weeks and exclusive instructor internships including up to 16 weeks paid work with the Snow School guaranteed.